Once you've made fruit powder, the next logical step is learning how to make pixy stix. 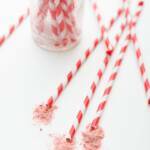 Homemade pixy stix are straws filled with fruit powder and sugar. Whizz fruit powder and sugar together in a coffee grinder or food processor until fully combined. Fold over the bottom of a paper straw. Pour powder into the straw until almost full, leaving room to fold over the top. I used a rolled up piece of paper to do this, as shown in the photo above. Fold over the top of the straw. Hand to someone and wait for their smile! You can adjust the ratio of sugar to fruit powder to whatever sweetness level you are comfortable with.